Proline, Utility Brush Cream Plastic 8 1/2 & 20"Proline, Utility Brush Cream Plastic 8 1/2, Item # BRU4308, Chemical- and water-resistant, crimped polypropylene for general use. Home | Facility Safety | Janitorial Supplies / Food Service | Proline, BRU4308 Utility Brush Cream Plastic 8 1/2 & 20"
Proline, BRU4308 Utility Brush Cream Plastic 8 1/2 & 20"
Polypropylene Utility Brush - 8.5 inch has stiff, no-scratch bristles aid you in heavy-duty scrubbing tasks. Handle with finger notches helps improve comfort. Lanyard hole enables hang-hook storage. Includes one brush. Cream Colored Polypropylene Plastic Block Utility Brush Standard utility brush has a foam plastic handle with hang-up hole. * Brush face 5-1/2 x 5. Trim 2. * Chemical- and water-resistant, crimped polypropylene for general use. 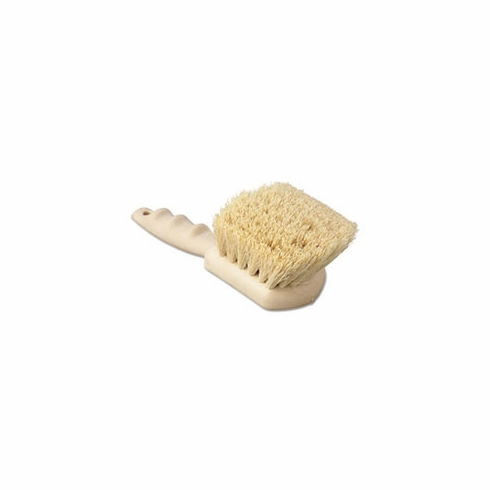 (BRU 4308):Cream Colored Polypropylene Plastic Block Brush, Overall Length 8-1/2in. (BRU 4320):Cream Colored Polypropylene Plastic Block Brush, Overall Length 20in.